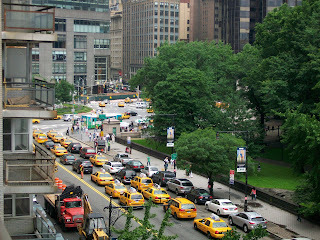 BACKTIME: I Like New York in June, How About You? Central Park looks nice and lush because it's been raining forever. The US Open over on Long Island looked more like the British Open. The Yankees played Washington on Thursday afternoon...after a 5+ hour rain delay. This was a rare dry moment. Second straight weekend a family event has the clan alive with wonder. While dodging raindrops, the trip included a Broadway show, a few subway rides, pizza and bagels...and my wife's adrenaline got going in some Soho boutiques. Caught some typical NY events like people lining up around the corner for the new iPhone. And some typical events happened to me like getting a summons for blocking the box. Outrageous fine but no points. What was I thinking driving from midtown to friends in New Rochelle on a Friday rush hour? And the cops are out everywhere. Bloomberg's New York is different from the one I resided in. There is no shortage of manpower to ticket vehicles, provide police/security presence, or clean up the streets. Times Square is a family-friendly international mixing place...which obviously has its share of negatives. But NY hotels and theatres keep raking in the dough in an unbecoming economy. But the trek was all about grandkids and great-grandkids who were there to see Oma celebrate her 90th Birthday.